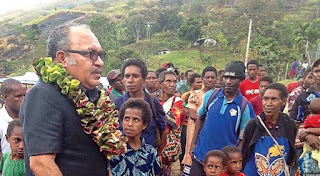 Tapini Rural Local Level Government which is comprised of ten wards with a population of approximately 7,315 warmly welcomed the Hon Prime Minister Peter O’Neill and his delegation into the mountainous region of Central Province. Despite having an office in the district, most of the public servants do not reside in Tapini but work and leave in Port Moresby. Speaking from Tapini, the Prime Minister has urged all public servants to return to Tapini and perform their appointed duties from there. Mr O’Neill told the people that he would ensure that necessary facilities like printing machines, and other office equipments are made available so services are provided in the district. Amongst the delegation was Education Minister Nick Kuman, Provincial Affairs Minister Kevin Isifu, Housing Minister John Kaupa, Central Governor Robert Agarobe, Member for Kairuku-Hiri Peter Isoaimo, Goilala MP and Minister assisting the PM on Bougainville Affairs William Samb. Local MP for Goilala while speaking at the opening of the Goilala district office on Monday shared the same sentiments as the Prime Minister to see that the office is occupied by people and not insects and dust. Provincial Affairs Minister Kevin Isifu was given the honor to open the office. Mr Samb told the people that he had great plans for the district and on Monday saw the signing of an MOU between the Coffee Industry Corporation and the district for coffee rehabilitation and extension. The district will also engage heavily on agriculture which will see the farming on bulb onions and potato. Communication is very important and the district will be installing V-Sat Disc around the District. Mr Samb in his speech also asked the governments assistance in upgrading the Mona (Goilala Highway). Together with Governor Agarobe, they have made a submission which was given to Prime Minister O’Neill for the Kairuku-Hiri road to Tapini. And lastly, Mr Samb called on the Civil Aviation Authority to include Goilala in its rural airstrip rollout program. This was Prime Minister O’ Neill’s first official visit to Goilala and he said Goilala was a challenging district just like other remote places in the country that are struggling but he would like to see that these places receive these basic services and government is adamant in providing those basic needs like cheque printing machine which he will instruct the Finance Secretary to do so for Goilala.